We’re taking a detour today. We’ve been eating a lot of healthy foods recently. But isn’t it time to enjoy a treat? After all, it’s the summer and it’s ok to indulge occasionally. Some fall after-school classes are even open for registration. But, this week we’re teaching 400 students through Glendale Unified how to make Eggplant Milanese and Argentinian Empanadas. And yet I’m craving something sweet and delicious. The Chocolate Pancakes were featured during our “American Favorites” day of summer camp and is a super-simple pancake recipe bursting with chocolate flavor. One of the best part is making whipped cream from scratch. We add the heavy milk to a large bowl and take turns whipping until stiff peaks form. Then we add a bit of sugar and vanilla and whisk again. If it’s whipped correctly, you can hold the whipped cream upside down and it won’t fall on your head. 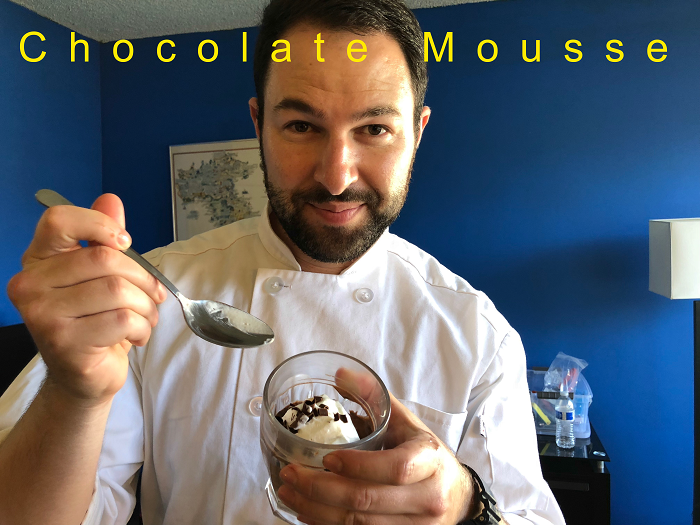 Chocolate Mousse was featured on our “French Favorites” day of camp and is typically made with a double boiler, but we created an easier version using just a handful of ingredients: mini marshmallows, semi-sweet chocolate, butter, sugar and heavy cream. It looks gourmet and has a rich and luxurious taste. Try it out next time you’re cooking for a crowd.